Violet Sugar is normally a fragrance I would never purchase – it’s floral and floral and my allergies just do not get along. I was intrigued though since it has sugar blended in and when I smelled it… the violet seemed more subtle and mellow. I liked it. It was still a floral violet but sweeter, almost softer. I loved the label on the clamshell pack by the way. It showed soft and delicate violet petals covered in sweet sugar. The background was white with warm purple accent coloring throughout – I thought it was really well done and so pretty. Simple and accurate. This scent is indeed a perfect blend of both elements and the overall fragrance was smooth and perfect for spring. Time to see what it smells like melting. I had a feeling this would be a huge room filler. Once I placed the wax in my electric melters, it didn’t take long to start noticing the fragrance – within minutes. The scent…. really lovely. And I was so surprised because I could smell the violet loud and clear… it was the sweetness blended in that kept it from becoming too heavy. My allergies weren’t bothered and I didn’t get a headache like many floral scents can bring on. All in all, I really enjoyed it and think it’s a perfect fragrance for spring. It’s bright, sweet, cheery and fresh. All elements I love when it’s sunny and warm outside. This would also be a great scent to try if you’re on the fence with floral fragrances. I think this is a happy medium. Also want to mention, even my brood didn’t mind this one and we’re talking all boys who hate floral scents. Not one said a word to me the entire time I had it melting. I call that a win. Strength – These melts are pretty strong. On a scale of 1 to 10, I’d rate this fragrance a 9. I started noticing the scent moments after placing the wax in my melters. Within 10 minutes, it was room saturation and within an hour, the entire upper level of my home smelled like sweet violets and sugar. I loved it and yep… I’ll be purchasing it again for sure. Definitely give this one a try if you’re in the mood for a sweet and fresh spring fragrance. I think you’ll be surprised like I was. 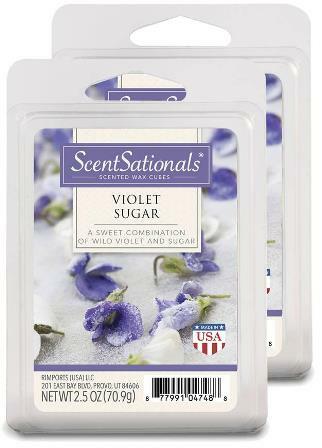 Have you tried Violet Sugar from ScentSationals? What did you think? In the comment section below, review and star rate your experience… it’s easy! Scent description for Violet Sugar - A sweet combination of wild violet and sugar. I was hesitant to try this scent because I'm not a floral fan but I have heard so many wonderful reviews I needed to give it a try. I'm so glad I did, it has quickly become my go scent this spring.